Maltodextrin & Why You Should Not Use It. Maltodextrin is a highly processed corn product (most of the time). I believe that nobody should be using the stuff unless you want to look like an offensive line-man for the Chicago Bears. 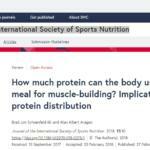 Most sports nutrition experts will recommend maltodextrin based on their hypothesis that it raises insulin levels in the blood to cause a more anabolic condition in the body, thus creating more muscle growth. I, on the other hand believe this recommendation is comes from the birth of higher profits through the sales of their products such as weight gainers and meal replacement powders. 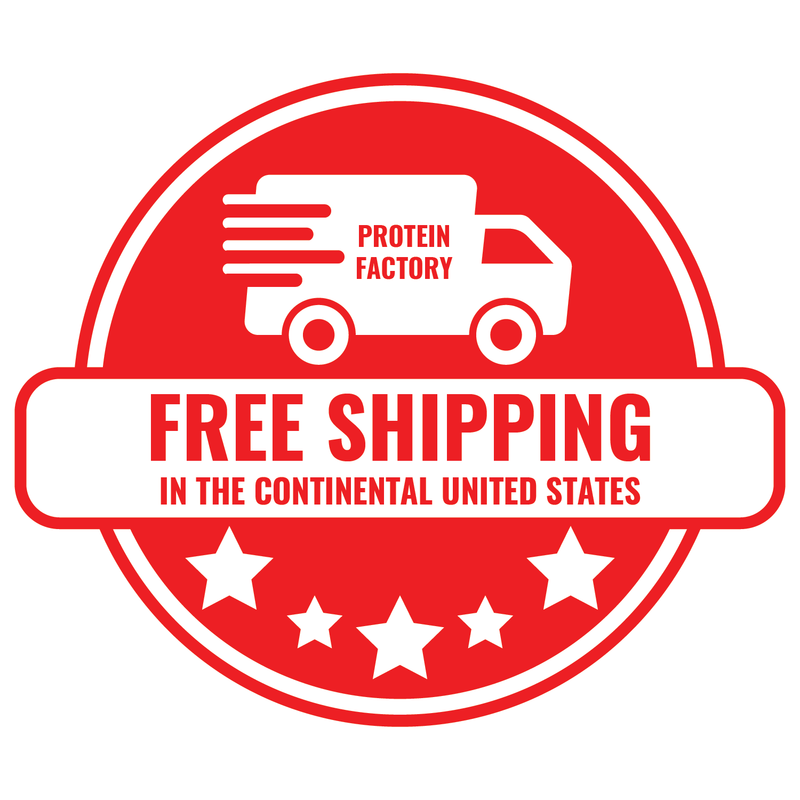 Back in 1998 when I started my business Proteinfactory.com and I began to customize protein powders and other food powders, I had maltodextrin, dextrose, and fructose as my choice of carb products that my customers could use in their powders. Whether they wanted to create a meal replacement powder or weight gain powder, the ONLY choices of carbs were these highly processed corn products. There was nothing else to chose from. Because of this, the consumer had no choice but to consume a product that was made to spike their insulin levels very high in the body. 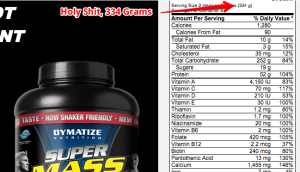 Typically when I make a custom formula for someone, I would use about 40% maltodextrin in a meal replacement powder. This would give someone about 40 grams of carbs and about 50 grams of protein. The powder would mix well and taste very good. As you might know this already but corn products taste very good. Not only that but its cheap. So not only would my customer be getting a custom meal replacement powder, but it would be very inexpensive. Also the powder did not have any sugar in it. Why? Because even though maltodextrin spikes your insulin level very high, it does not have any sugar. Thus the unsuspected consumer would think they were doing their body good. Goodness, however, was not being partaken in. Back in 1998, everyone thought that corn powders such as maltodextrin and dextrose were the ideal carb powders to use. They believed this because that is what was these large corporate food companies wanted you to believe. “Oh yes, drink huge quantities of our process carb powder, and you’ll replenish your glycogen quickly and get quick boosts of energy,” was typically the marketing cheer. What they did not tell you was that you’d CRASH dramatically from the rapid drop in insulin. You’ll also shut down any chance to burn body fat and increase fat stores. Forget that our products are probably related to the high rat of obesity and diabetes in this country as well. This is where my conspiracy theory comes into play. 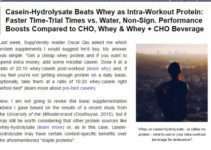 For I believe that all of the studies conducted on maltodextrin and dextrose in relationship to sports nutrition recovery are based on pushing these products in a positive light by saying the replenish glycogen quickly and result in quick energy ect, just to simply sell more product. For the big food corporations, and supplement companies know one thing. 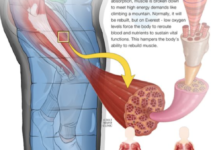 That is exactly what happened when EAS, can out with a powder called Myoplex. Myoplex was simply a maltodextrin, whey protein, creatine powder with some vitamins. A very simple formula to say the least. I would make this formula all the time when I was customizing protein. Again I would recommend to my customers that would call for customization help. 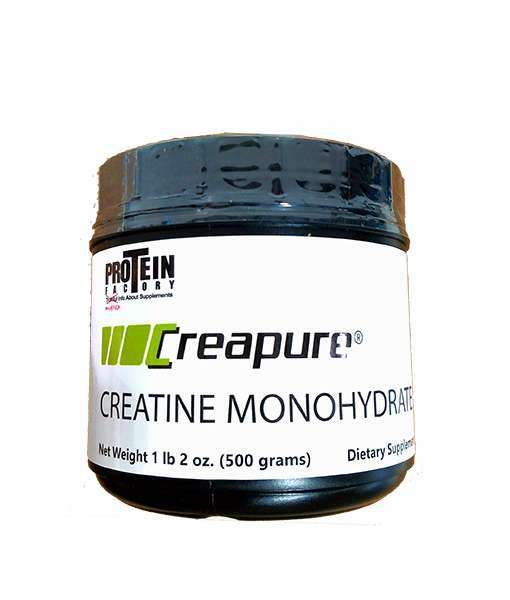 50% Maltodextrin, 40% whey protein, 10% protein and enhance it with vitamins and minerals. Again it would be a lot cheaper than Myoplex that you could buy at GNC. EAS essentially created the first meal replacement powder but instead of it making you lean, it would get you fat because of the maltodextrin. However, everyone thought it was the next best thing since sliced bread because they sold the hell out it and Bill Phillips the owner of EAS became a millionaire. 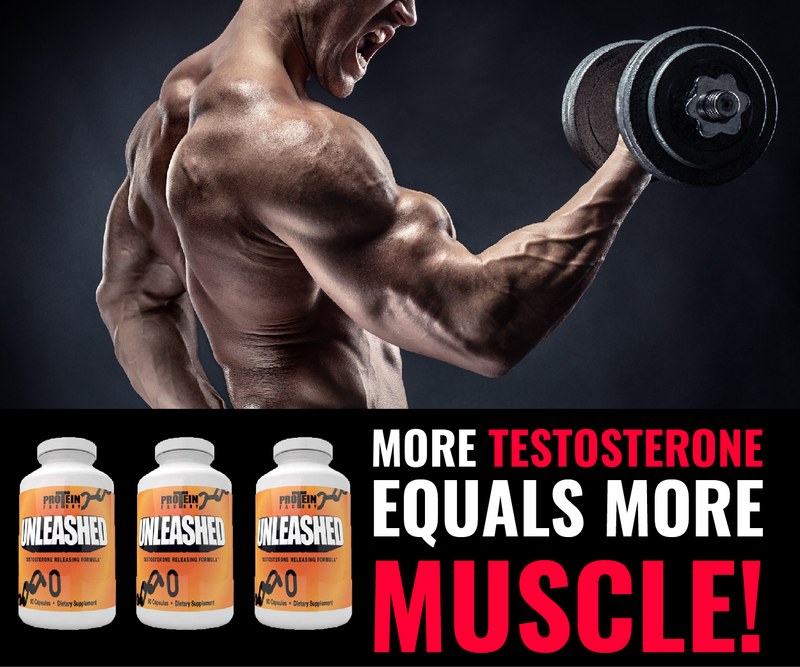 Ninety-nine percent of supplement companies simply copy other companies products and marketing materials, so obviously they copied EAS Myoplex. And they copied the formula they best they could, simply using maltodextrin and dextrose. Next thing you knew maltodextrin was a hit. Maltodextrin became a huge hit in weight gainers. 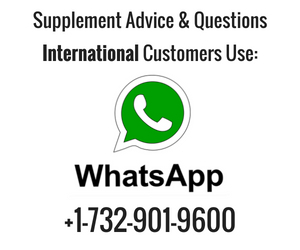 Common sense tells you that why would maltodextrin be used in a weight gainer but at the same time be used in a meal replacement powder. To this day supplement companies that make weight gainers, meal replacement powder, and even weight loss formula will use maltodextrin as the carb source. The weight loss formulas are the biggest joke. 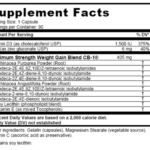 I’ve seen weight loss formula use soy protein as the protein source and fructose and maltodextrin as the carb source. 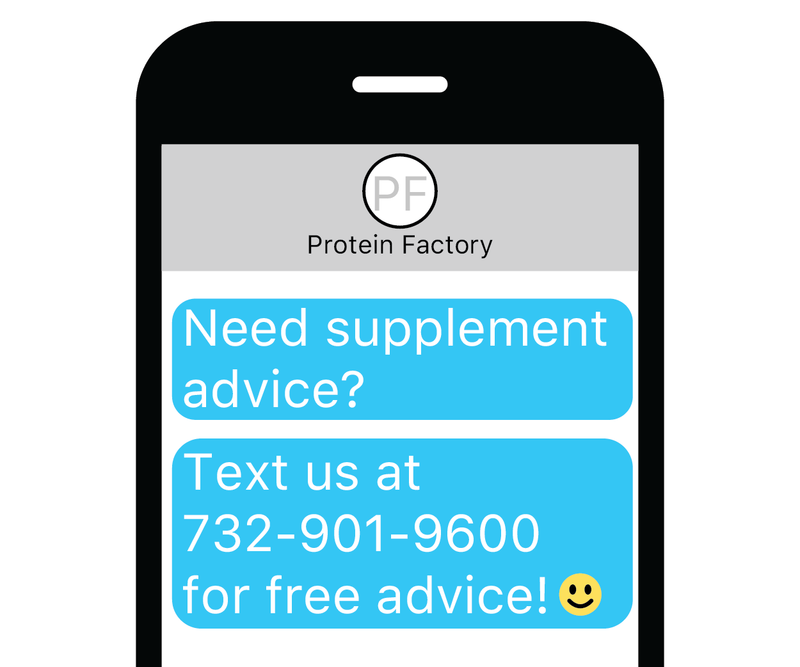 for these supplement companies know that most people do not read the fine print (ingredients) and simply just look at the nutrition facts. The buyer will see 15 grams of protein, 10 grams of carbs, 0 grams of sugar. And upon tasting it. AWESOME!! sold! These formulas are horrible to use. 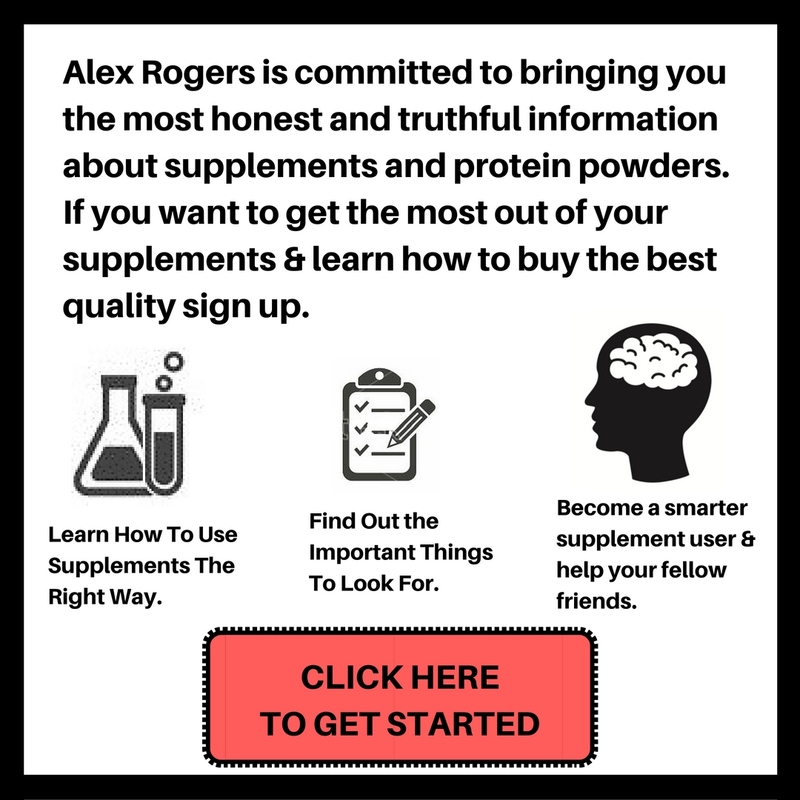 As I became more knowledgeable about maltodextrin and its impact on the body, I looked for an alternative for my company. And wouldn’t you know it, nothing to be found. Not one single stinking carbohydrate powder that I could purchase in bulk to make custom meal replacement powders with. All you had available was maltodextrin, dextrose, and fructose. Being the entrepreneur that I am, I began to research the best carbohydrates for building lean muscle. If you google this you’ll find that oats is one of the holy grails of carbs when it comes to bodybuilding and putting on lean mass while losing body fat. Therefore I set out to create the first oat powdered carbohydrate called Oatmuscle. First I went after the obvious, oat flour. However, upon experimenting with the oat flour and looking at the nutrition facts, I knew that if I used this product it would be a big disappointment to my customers. First oat flour does not mix at all with a spoon. In fact, it barely mixes with a blender. Oat flour is made for baking, not for making into a drink. If you tried to mix oat flour all you would get is a mud-like, clumpy, disgusting mixture that you couldn’t drink. Also it was very high in fiber which would cause a lot of digestive issues with a lot of people. Not for the people that have constipation problems obviously but for most people, oat flour would cause a big problem. Therefore I knew that oat flour was out of the question. On a side note, many companies use oat flour today because they are trying to copy me but cannot figure out how I do it. 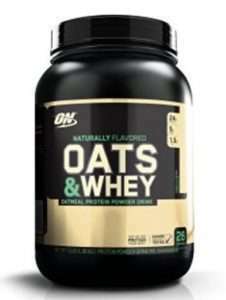 The biggest whey protein company in the world, Optimum Nutrition I believe sells a product called Oats and Whey. It is a big JOKE in my opinion. And at the same time a compliment because imitation is the best form of flattery. 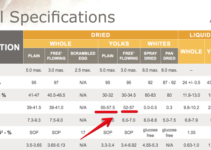 Look how they use oat flour….and sugar!! lmao!! It looks like Optimum Nutrition tried to change their formula…they replaced “sugar” with evaporated cane juice, and added Honey….this is just a marketing trick. I took this off the intrawebs. I cannot tell you the details of how I created the product that we now sell called Oatmuscle, but I can tell you that I did successfully create the world’s first powder carbohydrate that was not made from corn, was not maltodextrin, dextrose, or corn starch. UPDATE: We recently added the complex carbohydrate supplement called Mod6 which is a combination of 6 different grains, all low-gi, all natural, and no maltodextrin. The product is phenomenal. It mixes so easily with a spoon with zero clumping. Not only that but it tastes remarkably good. It has a slightly sweet taste to it because it does contain natural sugars coming from the oats. However, nothing is added, and it does not go through a harsh hydrolyzed/acid process like maltodextrin and dextrose. In conclusion, do not use maltodextrin. 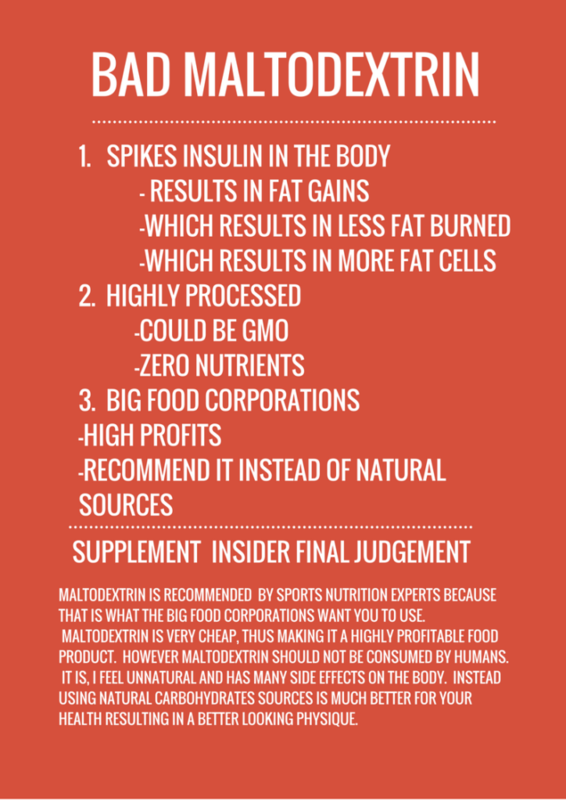 MALTODEXTRIN IS RECOMMENDED BY SPORTS NUTRITION EXPERTS BECAUSE THAT IS WHAT THE BIG FOOD CORPORATIONS WANT YOU TO USE. MALTODEXTRIN IS VERY CHEAP, THUS MAKING IT A HIGHLY PROFITABLE FOOD PRODUCT. HOWEVER MALTODEXTRIN SHOULD NOT BE CONSUMED BY HUMANS. IT IS, I FEEL UNNATURAL AND HAS MANY SIDE EFFECTS ON THE BODY. INSTEAD USING NATURAL CARBOHYDRATES SOURCES IS MUCH BETTER FOR YOUR HEALTH RESULTING IN A BETTER LOOKING PHYSIQUE. My Cortisol Crushing Cocktail For New Muscle Growth.